The Flower Council of Holland, the worldwide marketing arm of the cut flower and houseplant industry of the Netherlands. 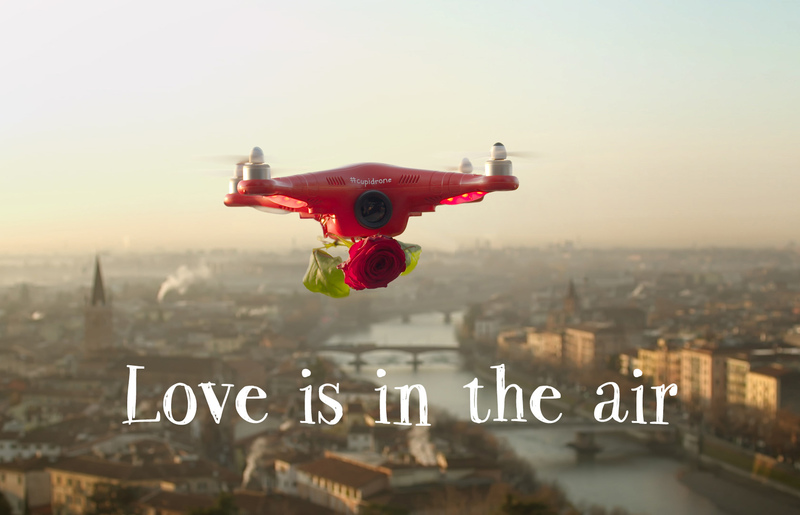 has launched an advertising campaign featuring the Cupidrone, a specially designed romantic flower delivery system. 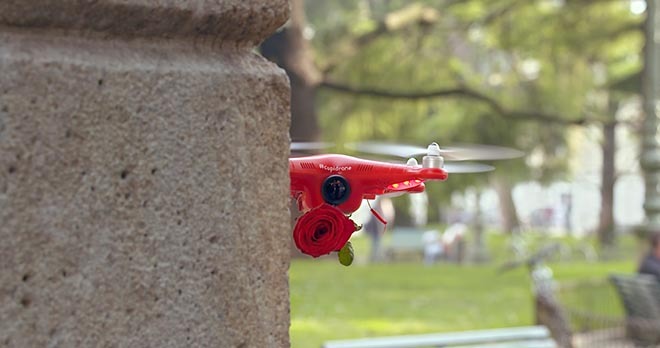 Timed to coincide with Valentine’s Day, the Cupidrone Valentines Day Delivery YouTube video takes viewers to Italian city Verona, the home of Shakespeare characters Romeo and Juliet. This modern day Cupid’s mission is to patrol the streets of Verona from above, searching for enamoured couples and lonely souls who are looking for love. When Cupidrone spots his target, he drops a red rose. Video footage of members of the public and actors demonstrates the power of a rose. Kingsday worked closely with director Edwin Nikkels to create the film’s epic yet intimate style. The campaign features the real people of Verona and their genuine reactions to flowers. Using mainly real people instead of actors is an approach Kingsday’s previously used for The Flower Effect campaign in 2014 for the same client. The Flower Effect has been viewed by over two million people across Europe. Kingsday’s strategy is based on creating conversation value for their clients through activating ideas that aren’t solely dependent on traditional media spend. 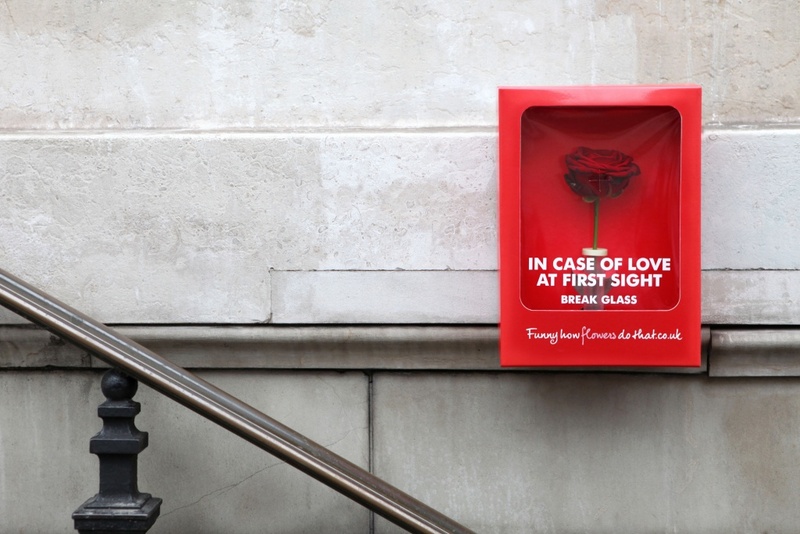 Last year Kingsday spread love and happiness all over Paris with 1,500 little red emergency boxes. In Case of Love at First Sight, Parisians could break the glass and help themselves to a rose. The Cupidrone campaign was developed at Kingsday by creative director Bram de Rooij, creative Luuk van de Ven, and agency producer Zoë Taselaar. Filming was shot by director Edwin Nikkels via Back2Back with producer Daan Starrenburg, director of photography Pieter Colombijn, editor Philip Smeulers, sound designer Dyno Hedges, music consultant Michiel Lisseveld and colourist Rachel Stone. Italy Crew were line producer Francesco Papa, production assistant Matteo Murru, runner Mirko Bressan and make-up artist Maura Fabbris. Media was handled at Universal Media. Filming was supported by Comune di Verona, Settore Cultura and Verona Film Commission.